Could an unauthorized individual gain access to backed-up data? Could backed-up data be altered? Will necessary data be available when needed? Is data safe from fire, floods, and human error? 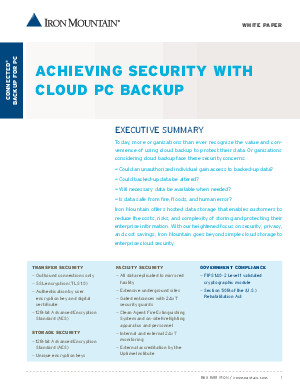 Read this paper to learn how Iron Mountain's heightened focus on security, privacy, and cost savings, goes beyond simple cloud storage to enterprise cloud security.